If we want more KPI accountability, we have to be honest about who’s really in control of it, and what’s really in the way of it. Most people will say we need more accountability for performance if it’s ever going to improve. But we still don’t have anywhere near as much accountability as we want. We still complain that people won’t take ownership of performance measures or performance improvement. We still have endless stories about how people will manipulate or game the measures to make performance look good. Whatever method we’ve been using to get more accountability, it’s not working. We’ve used reward and recognition to improve accountability. We’ve used ranking and public comparisons to improve accountability. We’ve even used cajoling, education, and threats. In the movie The Circle, the central idea is that by making everyone’s entire lives completely transparent to the rest of the world (with a creepy collection of cameras everywhere), there will be perfect accountability. If everyone else can see and hear what you’re doing at any point in time, then you’re not going to lie, cheat, steal or do anything else unsavoury. You just won’t get away with it. All these methods for increasing accountability have one thing in common: they are external triggers. 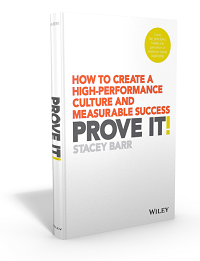 Can we really force people to be honest about performance and accountable for what the KPIs say about performance? Accountability is given, never able to be taken. So honesty, ownership and accountability are 100% within a person’s control. When we try and force it out of people, they just find creative ways to wriggle free of it. And usually this makes performance worse, not better. Rather than wasting our energy trying to make someone accountable, it might be more fruitful to explore what’s stopping them from choosing to be accountable. And perhaps our effort is better spent on removing those obstacles. So, what would stop someone from wanting to be accountable? Are these reasonable fears? Are they realistic fears? Why are the fears there? Past experience? Overt or covert threats? These fears are the elephant in the room. You have to talk openly about them. And you have to decide if the causes of these fears are really ever going to change. And who should, can and will change them. And what would help someone want to be accountable? I might be naive and gullible, but my preference is to assume that all people are fundamentally good. It influences how I show up, how I engage with people, and how they feel around me. And 999 times out of 1000, this works. If we assume that people are fundamentally good, then we can assume they care about something more than themselves. When we care about something more than ourselves, and we want to contribute to it, we more easily feel accountable. 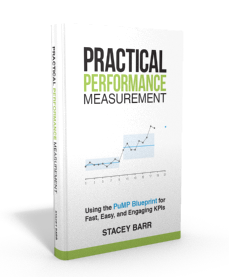 So I suspect that one of the best ways to help people feel accountable for performance and using KPIs, is to first help them find something in improved performance and using KPIs that they care about. 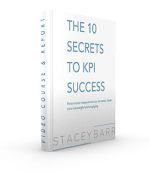 To get more KPI accountability, we must realise that it can’t be taken, only given. So what stops people from giving it? What strategies has your organisation used to get people to be more accountable for performance? Have they worked? How do you know?